Yes, this canvass top finally gave out - after 12 years. The lifetime expectancy claimed by the manufacturer? Five to seven years. Canvass, whether it’s stretched out across your T-top or it merely covers your boat when not in use, is one of those things we expect to replace. We know it has a limited lifetime, and eventually will start ripping, leaking, and sagging. What many boaters don’t realize is that this lifetime can be extended—by several years—by taking a few simple steps. Yes, this canvass top finally gave out – after 12 years. The lifetime expectancy claimed by the manufacturer? Five to seven years. 1. Treat your canvass with a water repellent/protector; but note that you need to follow the instructions to a tee. This is easier said than done. This stuff must be applied to the canvass when it’s completely dry, and needs a good 12 hours to dry itself. So you need to wait until any dew or rain has been dried by the sun, yet apply the stuff as early in the day as possible so it gets plenty of dry-time before rain or dew can get it wet again. 2. Park your boat in a shaded area. This simple step will have a dramatic effect on your canvass, because UV rays are the number-one cause of deterioration. 3. Wash down the canvass with a gentle soap, when you wash down your boat. Getting rid of the dirt, grime, and salt crystals is important—but it has to be done gently. Not only should you use a gentle soap for this job, you also need to make sure you use a gentle brush (no stiff bristles, please). 4. Every month or two, check the line wrapping T-top canvass to the metal frame for tightness. If there are any loose areas, tighten them up. 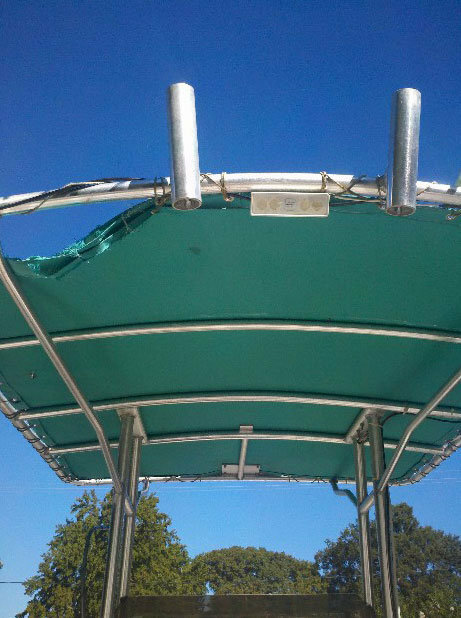 This will prevent the top from flapping in the wind, which will lead to ripping and stretching. 5. When you’re getting new canvass made, ask for reinforcements to be added anywhere the canvass rubs anything. Do these five things, and your canvass will out-live the predictions. Of course, there’s one final factor that will also have a huge impact on your boat canvass lifetime: the original quality of the material. You can’t cheap-out and expect miracles. But if you start with a high-quality canvass and take these steps, you’ll be in for years of use before that canvass needs replacing.